The final version of the PFRA review and update project was based on an earlier project and includes all changes resulting from the governors’ opinions being taken into account. • Approved the draft review and update of the preliminary flood risk assessment. On 21 December 2018, the report on the review and update of the preliminary flood risk assessment was published on the website of the Public Information Bulletin of the Ministry of Maritime Economy and Inland Navigation. The report on Poland's review and update of the preliminary flood risk assessment shall be presented to the European Commission by 22 March 2019. 1,361.9 km is sections of rivers indicated in the review and update of the PFRA in 2018, for which the FHMs and FRMPs will be developed in the second planning cycle of the DP. In addition, watercourses with a total length of 1,374.4 km and showing a significant risk tendency have been indicated. Szczecin Lagoon and Dziwna Straits, which do not have a mileage. Floods resulting from the destruction or damage of dams – 26 dam reservoirs with the dam height over 10 m, 10 in the Odra basin and 16 in the Vistula basin have been identified as FRAs. In addition, 1 reservoir showing a tendency towards significant flood risk was indicated. 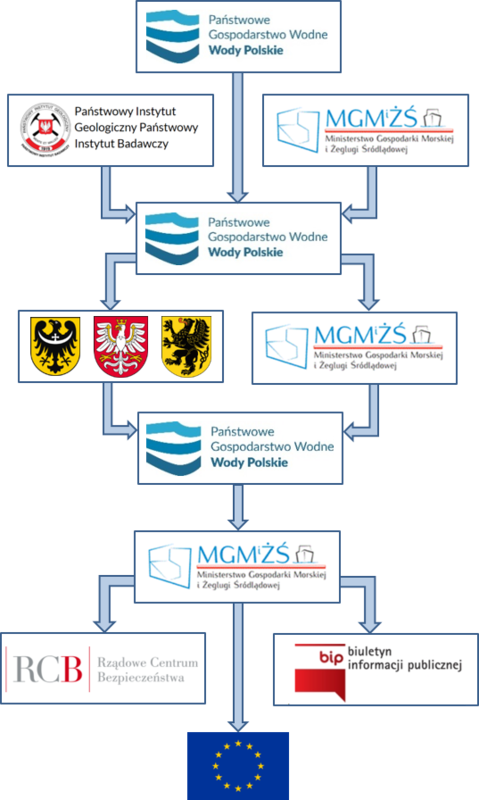 Cartographic visualisations of the review and update of the preliminary flood risk assessment were performed for the territory of Poland and in river basin areas, water regions and provinces. They are available for download in the project library.